In an interview with Fusion, Planned Parenthood President Cecile Richards seemed unprepared to answer the simple question of when she thinks life begins. At first she claims it’s not part the conversation before saying at the end of clip she thinks the lives of her three children began when she delivered them. While it's not surprising that the president of America's leading abortion provider thinks life doesn't begin until the child is born, Richards doesn't provide any reasoning for how her children were growing and developing without being alive. Carlos Michel, a maintenance worker in Houston, Texas recently saved the life of a child who was abandoned in a dumpster. Every morning, each maintenance worker at the complex is assigned to pick up trash in a certain area. It happened to be Michel's morning to clean near building 25. He first heard the newborn's whimpers as he dumped the contents of a bucket into the big bin. He said he used the bucket as a stool and peered into the dumpster, scanning the pizza boxes, soda bottles and fast-food containers before he identified the bag from which the sounds were coming. As he pulled the bag out, Michel noticed the outline of the baby. The child was upside down. As soon as he rescued the boy from the trash bag, Michel took off his gray work shirt and swaddled the newborn in it. The baby's dark hair was wet and sticky, possibly with placenta, and his body was cold. Michel brought the child to his chest, rubbing the baby's back, trying to use his own body heat to warm the boy. To prevent newborns from being left to die, the Michigan legislature passed a Safe Haven law in 2000 so newborns could be safely surrendered. The following PSA video discusses Michigan’s Safe Haven law. The Charlotte Lozier Institute looked at the abortion laws of 198 countries, independent states and semi-autonomous regions with populations of 1 million people and found that the permissive abortion policy in the United States was far outside the norm. For this report, it is appropriate to compare the United States with the other 58 countries that allow abortion on demand up to some point in pregnancy. The remaining 139 countries require some reason to obtain an abortion (that is to say, they do not permit abortion on demand) and are, by definition, more restrictive than the United States on the issue of gestational limits. To require some reason before obtaining an abortion is inherently more restrictive than not requiring any reason at all. This report finds that the United States is one of only seven countries in the world that permit elective abortion past 20 weeks. This finding suggests that current proposals in the United States to restrict elective abortions past 20 weeks would move the United States from the fringe, ultra-permissive end of the spectrum to a position closer to international norms. In a move that will have more than a few prolife people scratching their heads, Planned Parenthood is selling onesies online. For $15, America’s leading abortion provider is selling a onesie with the statment “Care. No matter what.” Planned Parenthood ensures that more than 300,000 unborn children a year will never get to wear their onesie. Care for your little one in this adorable 100% combed ringspun cotton onesie. Featuring our tagline, Care. No matter what, in an adorable heart design, this onesie is designed to handle everyday knock around. The good news is New York City's abortion rate is falling. The bad news is it's still appallingly high, 37% of all pregnancies in the city end in abortion, and the rate is 61% of pregnancies of black women. In 2012 73,815 unborn children lost their lives there, making it the leading cause of death of the entire state of New York, and more than every other death in New York City combined (51 thousand in 2011). Of 197,046 viable pregnancies, 73,815, or about 37 percent, ended in “induced terminations” in 2012, a new city Health Department report reveals. The abortion rate dropped 8.6 percent from 2011, and it has fallen 19 percent since 2003 and 22 percent since 2000, according to the analysis. The city’s abortion rate is still double the national average, but opponents of abortion applauded the substantial reductions. Marianne Anderson worked at the Planned Parenthood abortion clinic in Indianapolis for two and half years until July of 2012. She was recently interviewed about her experience working there by The Criterion, a newspaper of the Archdiocese of Indianapolis. Q. When did you start having qualms or misgivings about working for Planned Parenthood? A. “I started feeling uneasy working there when people came from [the] national [office] in New York City to teach us the conscious sedation process. It was disgusting. These two ladies had this chant they would do: ‘Abortion all the time!’ I thought, ‘I’ve got to get out of here.’ That was about six to eight months after I started. Q. What experiences stick with you? In their latest investigation into former abortionist Robert Alexander, WOODTV8 found him working at a STD clinic in Detroit and interviewed one of his former employees. Alexander's Muskegon abortion clinic was closed in December of 2012 due to unsanitary conditions. In recent years, the clinic was open only on Saturdays, with Alexander performing nine to 15 abortions on a typical day, the woman told Target 8. He charged less than others — about $377 plus $150 for medication, she said. The woman said the clinic’s ultrasound equipment stopped working about 1.5 years before the office closed, leaving Alexander guessing how far along his patients were. “So he would just do a vaginal exam, and you know, guess that way,” she said. The woman said she also witnessed botched abortions. The Eastern Echo, the campus paper of Eastern Michigan University, covered a panel discussion entitled, “The Abortion Controversy Continues.” The discussion was part of Right to Life of Michigan's Life Speaker Series during Black History Month. The event was co-sponsored by Students for Life group at Eastern Michigan and Catholics on Campus. Students of Eastern Michigan University made the trek to Halle Library on the night of Feb. 12 to attend a pro-life abortion panel. The panel was put on by Right to Life of Michigan with the help of Catholics on Campus, and featured a variety of experts, including a medical doctor, a pastor, community and nonprofit directors, and even an EMU student, Angela Little. The Calvin College Chimes recently featured an article on the new Students for Life group forming on campus. On Monday, Calvin College Students for Life held its first meeting. The event went smoothly except for one logistical problem: attendance was so good that there weren’t enough seats for everyone. Calvin College Students for Life is a new student organization on campus dedicated to educating people about alternatives to abortion, serving those affected by abortion and lifting the issue up in prayer. The Belgium parliament just voted 86-44 to approve euthanasia for children with no age limits. We believe death is never a good solution to any problem and obviously not positive for the health of children. The lower house of the Belgian Parliament adopted a bill that extends the right to euthanasia for minors, the Parliament said Thursday on its official Twitter account. The law passed 86 to 44 with 12 abstentions. That followed a vote by the country's Senate in December supporting the measure. The next step would see the bill go to the king, Philippe, to be signed into law. Steven Massof, an unlicensed doctor who worked for infamous former abortionist and convicted murderer Kermit Gosnell, was sentenced today to 6-12 years in jail. Massof pleaded guilty to two counts of third-degree murder. When Gosnell clinic was raided by Drug Enforcement Agency agents, they discovered his practice of killing infants who survived abortions. Steven Massof's voice cracked and he forced down a sob as he told Common Pleas Court Judge Benjamin Lerner he was "ready to take full responsibility for my actions and my inaction." Massof called his involvement with Gosnell a "horrific part of my life that will always be there." Lerner credited Massof's remorse and his cooperation with prosecutors before he even had a lawyer. Nevertheless, Lerner said what happened at the Gosnell clinic was "unspeakably horrible." 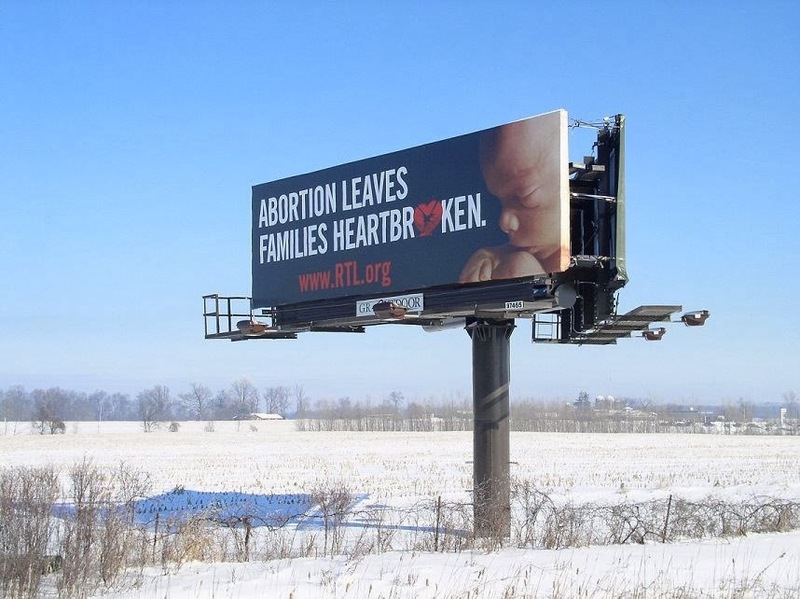 Grand Rapids Right to Life put up this billboard right on I-96. Abortion leaves families heartbroken. “(F)or the killing of the innocent is never fulfilling God’s will; in fact, it’s the ultimate betrayal of God’s will. The quote above was not taken from a speech by a prolife pastor. It was not used during a Sanctity of Human Life Sunday service. It was not spoken by the leader of a prolife organization. Believe it or not, the words above were actually spoken by an advocate of abortion on demand. These words were spoken by President Barack Obama. Since President Obama clearly doesn’t believe it is wrong to kill innocent unborn human beings nor has he done anything to uphold the dignity of those defenseless children, one has to wonder how he can say what he said at the National Prayer Breakfast. It’s almost as if he thinks human beings are wonderfully made when they are born and human life and dignity only emerge after birth. It’s almost as if he thinks the 56 million unborn American children legally aborted since 1973 never existed. Visit www.RTL.org to equip yourself to help you speak out against this kind of thinking which ignores the unborn. Planned Parenthood of Illinois (along with two other defendants) has been ordered by the Circuit Court of Cook County to pay $2 million to Alvin Jones III after reaching a settlement with lawyers representing the family. Jones is the young son of Tonya Reaves. Reaves died in July of 2012 after Planned Parenthood botched her abortion. President Obama says "each of us is 'wonderfully made' in the image of God"
In his speech at the National Prayer Breakfast this morning, President Barack Obama affirmed a number of prolife sentiments. He says that killing the innocent is wrong because every human being has an inherent dignity. That's basically the bedrock principle of the prolife movement. Despite saying something which could have easily been overheard at a prolife event, President Obama remains committed to abortion on demand, as evidenced by his recent statement on the anniversary of Roe v. Wade. At the Heritage Foundation's blog, The Foundry, Ryan Anderson remembers President Ronald Reagan's prolife stance with quotes from Reagan's book Abortion and Conscience of a Nation. Ronald Reagan was born 103 year ago today. I have often said that when we talk about abortion, we are talking about two lives—the life of the mother and the life of the unborn child. Why else do we call a pregnant woman a mother? I have also said that anyone who doesn’t feel sure whether we are talking about a second human life should clearly give life the benefit of the doubt. If you don’t know whether a body is alive or dead, you would never bury it. I think this consideration itself should be enough for all of us to insist on protecting the unborn. We're looking to hire someone to be a part-time graphic designer. The Guttmacher Institute recently released a paper which finds the number of abortions performed in the United States continued to decline between 2008 and 2011. In 2011, they claim there were 1.06 million abortions performed in the United States. This would put the abortion rate at 16.9 per 1,000 women (aged 15-44) and would be the lowest rate since 1973. Their previous report found that 1.21 million abortions were performed in 2008. The Guttmacher Institute is the former research arm of Planned Parenthood, America’s leading abortion provider. They attempt to obtain an annual number of abortions in the U.S. by surveying abortion providers. In many cases, they have to estimate how many abortions they believe a provider performed. We're looking for an experienced individual to videotape two panel discussions in Detroit and Ypsilanti on 2/12/14 and 2/26/14. This is a low budget project, but also a great opportunity to work with a highly visible statewide, non-profit organization. Please contact Kathy Crombie, Director of Minority Outreach at Right to Life of Michigan for more information.